As your baby grows, different rashes may appear on his skin. Conventional doctors will prescribe steroid creams, antibiotics and other remedies. While mainstream baby rash cures often cure the rash just fine, you might be interested in finding organic home remedies for these rashes. Organic home remedies give you the security of knowing what exactly is going onto your little one's skin, and keeps him from being exposed to questionable mainstream ingredients. You might even save money by curing your baby's rash at home. Always talk to your doctor before trying a home cure such as oil or herbs on your baby. Cradle cap can be defined as "a form of seborrheic dermatitis" and is "a skin inflammation reflecting disharmony," explains Andrea Candee, et al. in the book, "Gentle Healing for Baby and Child." It is quite common, and can be identified by scaly flakes in a baby's scalp. Cradle cap occurs when the oil glands are over-productive. Sometimes the most effective cure is to simply clean the affected area daily with water and then brush with a soft baby brush. You can try 1/3 cup organic oatmeal blended to a powder form in a food processor and mixed with 1/4 cup water. Apply the oatmeal mixture to the scalp, leave on for 10 minutes, then carefully wash away with water. Follow with a few drops of organic olive oil on the scalp. Diaper rash is a common occurrence on little bottoms. The rash is easily identified as red and irritated skin around the diaper area. 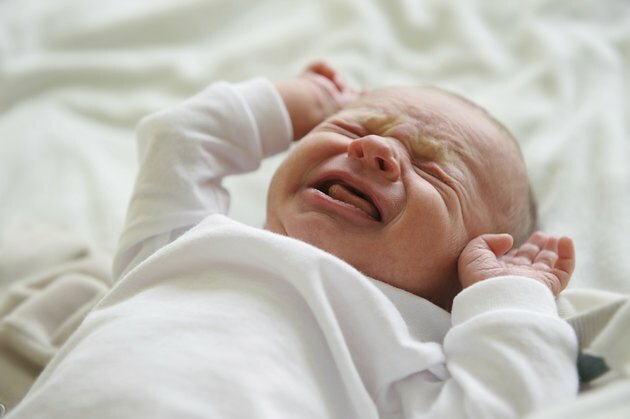 Some babies are more prone to recurring diaper rash, but it is usually caused by damp skin. Some measures you can take to prevent diaper rash include changing the diaper often and allowing the baby time during the day to "air out." To cure diaper rash, use organic slippery elm bark powder after baths to keep the skin dry. When your baby will be diapered for a long period of time, like nap or bed time, apply soothing organic calendula oil mixed with a bit of warm water to the bottom to soothe, moisturize and create a protective barrier from wetness. Eczema is a skin disorder characterized by dry, itchy, scaly or flaky skin. Eczema is common in infants and can be caused by food triggers like dairy or ingredients in soap and laundry detergent. It may appear anywhere, but is commonly found on the face, arms and legs. First try eliminating possible food allergies or skin irritants, recommends Jonny Bowden in the book "Most Effective Natural Cures on Earth." To clear up eczema with organic ingredients, try boiling two cups of water and adding one teabag each of organic chamomile and nettle tea. Let the tea cool and apply with a very soft washcloth to your baby's clean skin. A warm bath with 1/2 cup organic ground oatmeal can relieve itching. Thrush can be defined as "an overgrowth of yeast that occurs in the mouth and appears as white patches in the mouth or on the tongue," explains Laura Josephson in "A Homeopathic Handbook of Natural Remedies." Your baby may have a swollen mouth and might seem to be in pain when eating. Thrush may be caused by the use of antibiotics. For babies 6 to 12 months, try applying 2 tbsp. of sugar-free, organic yogurt with probiotics to the mouth with your clean finger. Applying one drop of organic garlic oil or organic black walnut extract four times a day can clear up thrush. Gentle Healing for Baby and Child: A Parent's Guide to Child-Friendly Herbs and Other Natural Remedies for Common Ailments and Injuries; Andrea Candee, et al. Naturally Healthy Babies and Children: A Commonsense Guide to Herbal Remedies, Nutrition, and Health; Aviva Jill Romm, et al. What Are the Benefits of Olive Oil for Eczema?